Support for Stephen Harper's Conservatives has increased to give the party a lead of almost 10 percentage points over their Liberal rivals, a new EKOS poll released exclusively to the CBC suggests. Support for Stephen Harper's Conservatives has increased to give the party a lead of almost 10 percentage points over their Liberal rivals, a new EKOS poll suggests. Asked how they would vote if an election were held "tomorrow," 34.4 per cent of those surveyed said they would vote for the Conservatives, compared with 25.1 per cent for the Liberals and 15.3 per cent for the NDP, according to the poll released exclusively to CBC News on Thursday. 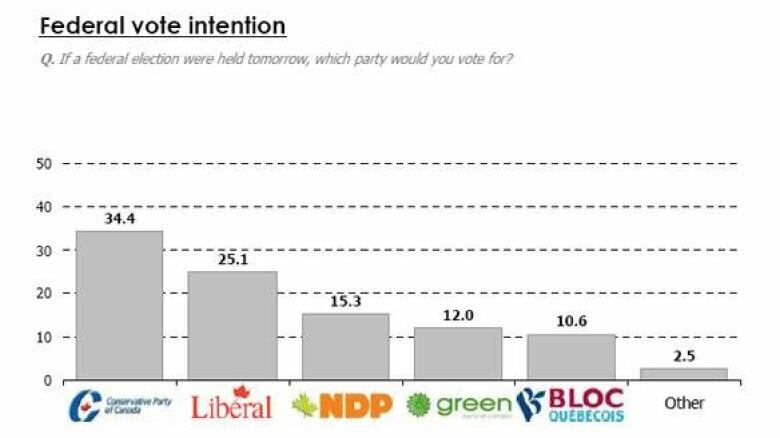 Twelve per cent of respondents said they would vote for the Greens, while 10.6 per cent favoured the Bloc Québécois. A week earlier, support for the Tories stood at 33.6 per cent, the Liberals at 27.1 per cent, and the NDP at 16.9 per cent. That means the spread between the Tories and Liberals has widened to 9.3 percentage points from 6.5 points, mostly because of the Liberal decline. The survey results marked the first time in months that support for a political party has surpassed the 34 per cent level. The gap between the Conservatives and Michael Ignatieff's Liberals has been slowly widening through the spring. Men continue to be stronger supporters of the Conservative party than women — 38.0 per cent compared to 30.7 per cent. As in recent weeks, there was no notable gender gap among Liberal supporters. Support for the Liberals among men surveyed was at 27.4 per cent and support among women at 25.5 per cent. Consistent with EKOS poll results in recent weeks, 51.1 per cent of those surveyed said the country is moving in the right direction, while 38.2 per cent said it's moving in the wrong direction. Conservative supporters, respondents in Alberta and in the Atlantic region are most likely to agree that the country is moving in the right direction, the survey suggests. This week's poll suggests Liberal supporters surveyed were more likely to report that the country is moving in the right direction (50.8 per cent) than the wrong direction (37.1 per cent). But they continue to be critical of the direction of the government, with 32.9 per cent saying the government is moving in the right direction and 52.2 per cent saying it's moving in the wrong direction. For the poll, EKOS queried 2,794 people by phone between May 12 and May 18. The main voter-intention results are considered accurate to within 1.9 percentage points, 19 times out of 20.